1911 Pistol Barrels | Jarvis, Inc.
1911 owners demand precision and accuracy, and we deliver. For over three decades we have been testing and perfecting 1911’s. In this time we have developed and perfected the most accurate barrels on the market. All of our 1911 barrels are made from Stainless Steel Forgings and hardened to 40-42 RC for superior strength and longevity. Button rifled with conventional rifling, we ensure that all critical locking dimensions are held to tolerances of .0005”. At Jarvis, Inc., our passion is firearms and our daily mission is to provide shooters with unparalleled accuracy and reliability. For almost 40 years we have been the leader in precision and accuracy. We do not compromise, and we demand perfection from ourselves because we believe that’s what our customers deserve. For decades we have been delivering precision and unparalleled accuracy to 1911 owners and manufacturers. Our manufacturing experience and knowledge of the 1911 platform has even allowed us to perform R&D work for companies such as Colt and STI. What separates us from the pack? It all starts with our uniquely designed stainless steel forgings that provide superior strength and longevity. 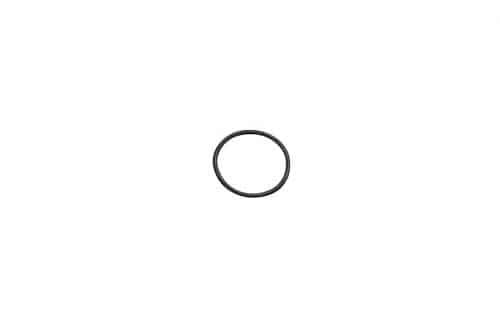 Our proprietary rifling process is done by rifling machines designed by us to ensure bore and groove dimensions are held to .0005″ tolerances and do not vary over the length of the barrel. This button rifling process produces a mirror like 4 to 6 micron finish. Every process, from drilling and rifling, to turning and milling is carried out by our experienced machinists and gunsmiths. At Jarvis, Inc. we believe that our experience and attention to detail are producing the finest 1911 barrels available. With honesty and integrity, we strive to serve our customers to the best of our ability on a daily basis. 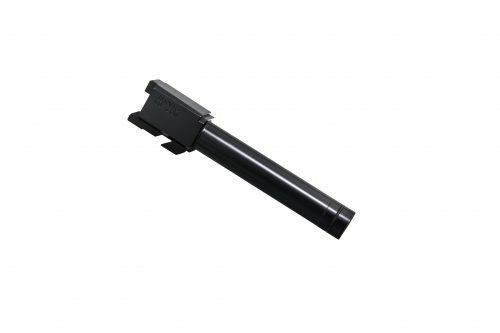 We offer 1911 pistol barrels for a wide variety of makes and models. Make refers to the manufacturer of the pistol, and model refers to the size. 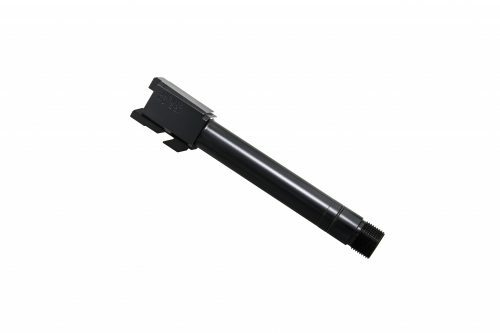 We offer barrels for the following makes: Colt, Kimber, Armscor, Para Ordnance, Springfield, Rock Island Armory, Remington, Ruger, Wilson Combat, Smith & Wesson, Sig Sauer, Les Baer, STI, SVI, and more. Models we offer include the Officers Model, Midsize (4″ and 4.25″), Government, and Long Slide. All of these models are available in a bushing or bull barrel configuration. We also offer barrels in the nonramped, Wilson/Nowlin ramped, and Para/Clark ramped configurations. Various customizable options are also available such as threaded barrels for suppressor or compensator use, extended length barrels, and ported barrels for reduced muzzle rise. 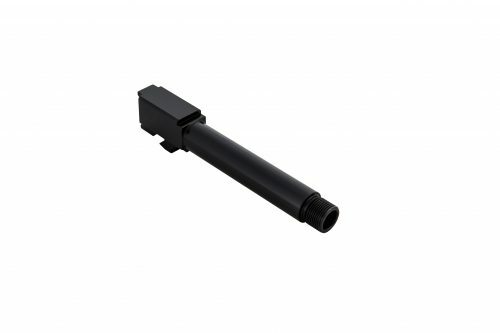 Our National Match fitting required barrels are left oversized in the link lug and hood to allow the user to achieve the tightest possible lock up in their pistol. 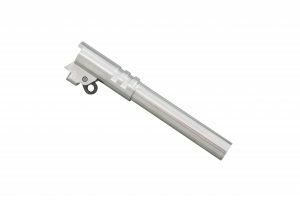 National Match barrels can be fitted by us which requires the customer’s complete pistol to be sent in. The customer can also choose to have the barrel sent to them oversized to be fitted by a gunsmith. We strongly recommend that all National Match fitting required barrels be fit by a qualified gunsmith. Unique to Jarvis, Inc. is the true drop-in fit 1911 barrel. Our drop-in 1911 barrels will fit into your gun upon arrival with no fitting required. Simply install the barrel and get to shooting. Our drop-in barrels have been tested and proven to deliver incredible accuracy. We have routinely obtained sub 1″ groups at 25 yards with our drop in 1911 barrels. We recommend customers to select the drop in option when ordering threaded barrels for suppressor use. The reason for this recommendation is that coupling the increase in recoiling mass of the suppressor with an extremely tight fitting barrel may result in frequent cycling issues.